This page is, at the moment, a quick data and reference source under construction on 10/26/2016. It shows copies of important data that might be altered with time, and as such it serves for the moment as a record of what was online early in our investigation. A black smudge on the face of Mars: All that's left of Europe's lander after re-entry ends in fiery explosion on planet's surface. Nasa has pinpointed the location of the ESA's lost ExoMars lander. New data from the American space agency's Mars Reconnaissance Orbiter has identified new markings on the surface of the red planet that are believed to be related to the Schiaparelli lander's possible crash. ESA believes that it may have exploded on impact. 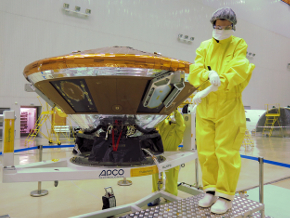 Data recorded by its mothership, the Trace Gas Orbiter, is currently being analysed to understand what happened during the botched landing. Images from the Mars Reconnaissance Orbiter (MRO) took pictures of the expected touchdown site in Meridiani Planum on 20 October. A new image released today shows two new features on the surface of Mars when compared to an image from the same camera taken in May this year. Europe’s ExoMars Trace Gas Orbiter made it to its final destination in full working order, unlike its land-bound companion. Scientists will use photos of the crash site and data relayed from the crashing lander to the orbiter to figure out what went wrong in the landing. Since the module’s descent trajectory was observed from three different locations, the teams are confident that they will be able to reconstruct the chain of events with great accuracy. The exact mode of anomaly onboard Schiaparelli is still under investigation. If the lander is truly dead, as its scattered parts on the Martian surface seem to indicate, there is still science to do in learning how, exactly, it happened, and how to ensure ESA's Mars rover, launching in 2020, doesn't meet the same fate. Science is an iterative process, and for every great leap for humankind, there are several other, less successful hops, and even some tragic fumbles, that we had to learn from first. The hazardous task of fuelling Schiaparelli, the ExoMars 2016 entry, descent, and landing demonstrator module, has been safely completed at Baikonur. The module now has sufficient fuel on board to power the thrusters it will use while descending through the Martian atmosphere in October this year. The 600 kg Schiaparelli module is equipped with nine thrusters, clustered in groups of three. These will be activated about 1.3 km above the surface of Mars to slow the spacecraft down to less than 2 km/h when about 2m above the surface. At this point, the thrusters will be switched off and the module will drop to the ground. The thrusters are powered by hydrazine, and the hazardous task of filling the fuel tanks with this toxic fuel and the successive pressurisation of the propellant tanks to launch pressure was completed on Sunday evening, by a dedicated team from Thales Alenia France who are in Baikonur specifically to take care of fuelling the module. There are three 17.5 litre (4.623011 gallon ) tanks on Schiaparelli. Each of these was filled with about 15 kg (33.0693 pounds) of hydrazine. But hydrazine on its own is not sufficient and the spacecraft also needs helium for its pressure regulated propulsion system to function. 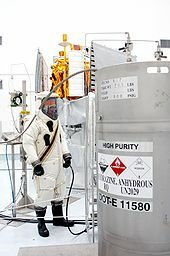 A high-pressure helium tank on the module had been filled with 15.6 litres of helium and brought to flight pressure (at approximately 170 bar pressure) before the hydrazine fuelling. This helium is used to pressurise the propellant tanks and bring the propulsion system to the correct operating pressure. While on the ground, closed pyro valves prevent the propellant from reaching the thrusters. Once in space, when the thrusters are eventually needed, the pressurised helium will be released into the propellant tanks to "push" the hydrazine into the propellant feed lines and towards the combustion chambers where the fuel will be ignited and forced out of the thruster nozzles. That process relies inherently on the helium pressure upstream of the hydrazine, which is maintained, via a pressure regulator, to the required operating pressure. 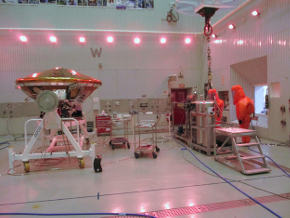 Fuelling operations began on Thursday when Schiaparelli was moved from the clean tent area of the cleanroom, where it had been for the other preparatory activities, into the dedicated fuelling area. 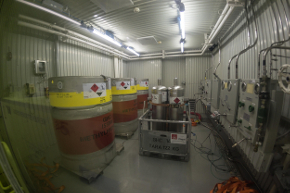 Preparations and safety checks were carried out on Friday and the actual hydrazine fuelling was done on Saturday, taking about two hours to complete the fuel transfer. On Sunday, the system was brought up to launch pressure, and by Sunday evening Schiaparelli could be declared to be fully fuelled and was ready to be brought back to the main cleanroom. The fuelling team will be busy for another few days as they take care of decontaminating the fuelling equipment so that it can be transported back to Cannes. Now that Schiaparelli has been fuelled additional safety precautions will be implemented for all activities that are carried out in the vicinity of the module. In practice, the presence of the hazardous fuel onboard Schiaparelli means that anyone working close by will need to carry a gas mask and wear an anti-acid protective suit. All personnel working in the cleanroom have had special safety training for what to do in case of a declared emergency, and as an additional safety measure, hydrazine detectors will be placed around the spacecraft. The Schiaparelli lander attempted an automated landing on 19 October 2016, but the signal was lost unexpectedly a short time before the planned time of the landing. ESA's Mars Express and NASA's Mars Reconnaissance Orbiter (MRO) and MAVEN listened for the lander's signal. Initial analysis of returned telemetry (600 megabytes of data) suggests that the heat shield and parachute deployment worked as expected, but the parachute was released too soon. In addition, the subsequent rocket thrusters firing lasted about 3 seconds instead of the expected 30 seconds, so a soft landing appears not to have occurred. Martian gravity: 3,711 meters per second squared. The parachute should have released at an altitude of 4,000 feet before thrusters fire to slow the craft down from 150mph to 2.4mph so it can land gently. But data suggested the parachute had been jettisoned too early, before the probe had slowed sufficiently. Although thrusters did fire to slow the descent, they did not burn for as long as expected which could also have left the craft hurtling towards the ground at high speed. In Nasa's 1999 Mars Polar Lander mission the retrorockets fired too early at the same stage causing the spacecraft to crash land. Mr Acoomazzo said it was ‘definitely a possibility’ that the probe had been accelerating too fast as it hit the surface. “The data have been partially analysed and confirm that the entry and descent stages occurred as expected, with events diverging from what was expected after the ejection of the back heat shield and parachute,” he said. “This ejection itself appears to have occurred earlier than expected, but analysis is not yet complete. That’s definitely a possibility (that is was accelerating too fast). “It could be that these parachute phases has been terminated too early then we were far too high, or we have a behaviour that has led the lander to be far too low. “We saw the thrusters fired for a few seconds, but much shorter than we were expecting. We can’t say if they all fired but we will be able to see that in the coming weeks. Oct 25, 2016: NASA states ,"Exactly what happened to the Schiaparelli lander is not yet known. ESA scientists hypothesize the module crashed when its thrusters were turned off prematurely. Instead of floating to a soft landing using thrusters, the lander dropped up to 2.5 miles at a speed of 184 mph (296.119 km/h). If the thrusters were not operational, then the module would have crash landed with a full load of fuel. The fuel would have exploded on impact, producing the large cloud of surface debris that was seen on the MRO footage. Read more: http://www.digitaltrends.com/cool-tech/esa-exomars-lander-explosion/#ixzz4O6TvtQAd Follow us: @digitaltrends on Twitter | digitaltrendsftw on Facebook"
The parachute system design is driven by the limited altitude between where the probe decelerates to a Mach number compatible with parachute deployment (Mach below 2.1 and a maximum dynamic pressure of 910Pa) and the surface – as little as 5 km. The reaction control system ensures final velocity control to provide safe and robust lander release conditions. The RCS definition is closely linked to the parachute capability and Descent Module GNC strategy. Descent velocity is optimized at 45 m/s (100.662 mph or 162 kph). The RCS GNC performance is characterized by its high throttle modulation capability and low response time. The system relies on 4 Aerojet MR-80B engines fed by hydrazine with a He pressurized system.